Online tickets are sold 1 ticket for $5 up to $50 per transaction. Weekly online ticket sales will begin at 8:00 a.m. the day after the weekly drawing and close at 8:00 a.m. the day before the drawing. 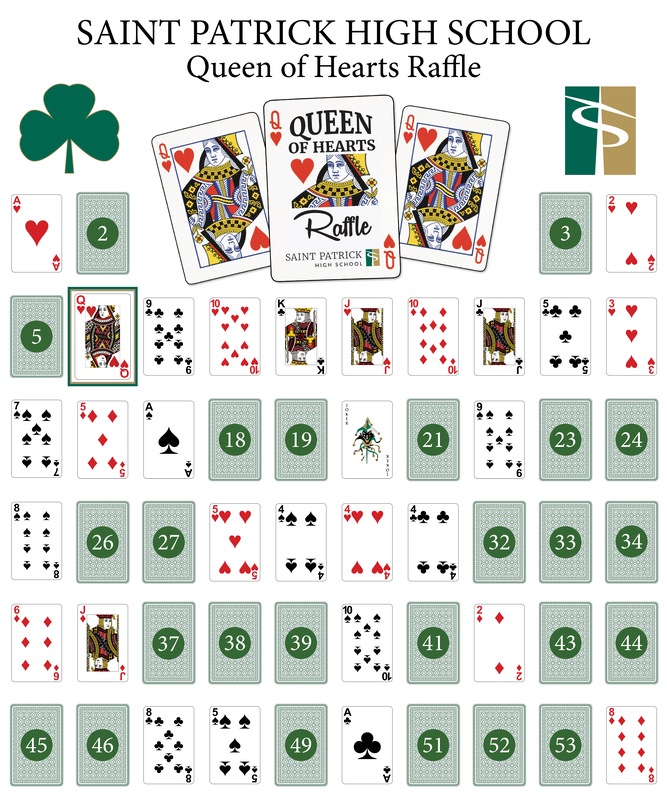 In each online transaction the purchaser will only be allowed to select a single number to represent the card in which they want to be revealed on the Queen of Hearts game board. That number, along with buyer’s name and phone number, will be written by a St. Pat’s representative on all of the tickets purchased in that transaction. Saint Patrick High School reserves the right to suspend online ticket sales at any time. The current jackpot is over $35,015.00! 10/11 ROLLOVER! The #40 card revealed the Ten of spades. Ticket holder received $50 for their ticket being drawn. Pot rolls over to next week. 10/18 ROLLOVER! The #28 card revealed the Five of hearts. Ticket holder received $50. 10/25 ROLLOVER! The #20 card revealed the Joker. Ticket holder received $100. 11/1 ROLLOVER! The #15 card revealed the Seven of spades. Ticket holder received $50. 11/15 ROLLOVER! The #4 card revealed the Two of hearts. Ticket holder received $50. 11/29 ROLLOVER! The #29 card revealed the Four of spades. Ticket holder received $50. 12/6 ROLLOVER! The #47 card revealed the Eight of clubs. Ticket holder received $50. 12/13 ROLLOVER! The #31 card revealed the Four of clubs. Ticket holder received $50. 12/18 ROLLOVER! The #11 card revealed the Ten of diamonds. Ticket holder received $50. 12/27 ROLLOVER! The #42 card revealed the Two of diamonds. Ticket holder received $50. 1/10 ROLLOVER! The #35 card revealed the Six of diamonds. Ticket holder received $50. 1/17 ROLLOVER! The #22 card revealed the Nine of spades. Ticket holder received $50. 1/24 ROLLOVER! The #30 card revealed the Four of hearts. Ticket holder received $50. 1/31 ROLLOVER! The #50 card revealed the Ace of clubs. Ticket holder received $100. 2/7 ROLLOVER! The #7 card revealed the Nine of clubs. Ticket holder received $50. 2/14 ROLLOVER! The #54 card revealed the Eight of diamonds. Ticket holder received $50. 2/21 ROLLOVER! The #1 card revealed the Ace of hearts. Ticket holder received $100. 3/7 ROLLOVER! The #17 card revealed the Ace of spade. Ticket holder received $100. 3/14 ROLLOVER! The #14 card revealed the Three of hearts. Ticket holder received $50. 3/21 ROLLOVER! The #9 card revealed the King of clubs. Ticket holder received $100. 3/28 ROLLOVER! The #25 card revealed the Eight of spade. Ticket holder received $50. 4/5 ROLLOVER! The #10 card revealed the Jack of hearts. Ticket holder received $100. 4/11 ROLLOVER! The #8 card revealed the Ten of hearts. Ticket holder received $50. The next drawing is Thursday, April 18th at Galvin’s. Contact Wendy Motino at wmotino@stpatrick.org or (773) 282-8844 ext. 281.